The stairs are well attended, and it can get really rowded. Have you seen the beautiful pictures from the stairs and expect an outstanding display of flowers, you may be disappointed since it is'nt allways decorated. Below the square you will find the perfect shopping if you are looking for shopping. Here you find exclusive brands and the latest fashions and clothing trends. The Spanish Steps (Piazza di Spagna) is one of Romes classical sights. When it's decorated with flowers it really is worth a visit. The staircase and the square below, Piazza Spagna, is today a meeting place in Rome where italians and tourists meet and socialize. The area next to the spanish steps is the right place to be if you are looking for expensive designer clothes and the hottest fashion in other words, the perfect shopping. Here all the big brands has their own stores. The staircase is magnificent and you really should take look at it if you are in Rome. Personally I did not think it was so remarkable. Below the stairs it was crowdy and big scaffolding did its part to cut down the overall impression. Detail of the spanish steps and the buildings next to it. To the left at the top of the spanish steps you get a glimpse of the church Santissima Trinita dei Monti. Next to the spanish steps you find a statue "Immacolata" that was erected 1854th At the foot of the statue (not visible in the picture) you find sculptures showing Moses and David. Fact and history about the Spanish steps. 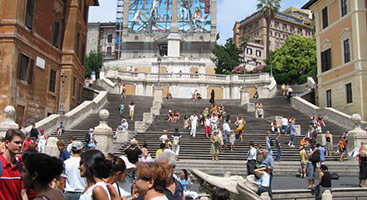 Spanish Steps, connects Piazza di Spagna with Piazza Trinita dei Monti and is located on the hill named Pincios slope. The staircase was designed by Francesco the Sanctis and was built in 1723 with money from France and with both the pope and the king's blessing. The real name of the Spanish steps is "Scalinata della Santissima Trinita dei Monti" but called was the Spanish Steps after Piazza di Spagna, the square foot of the stairs (spagna = Spanish). The name the Spanish Steps is not used by the Italians or the French. The staircase has 138 steps and is built in three levels, with three flights of stairs which is inspired by the Holy Trinity and the Church of Santissima Trinita dei Monti at the staircase crest. At the foot of the stairs is the Fountain Fontana della Barcaccia designed by Bernini's father, Pietro Bernin and built between 1627-1629. It is performed as a water-filled boat and is a symbol of where the Tiber flooded in 1598 when a boat must have been due to the Pncio. Barcaccia means freely translated "worthless boat."